Liquid oral medicines contain in their formulation agents to improve their appearance, bioavailability, stability, and palatability . Sugars such as sucrose, fructose and glucose are added to increase bulk, palatability and, consequently, compliance . These sugars are widely used because they are cheap, nonhygroscopic, and easy to process . Acids are also added to medicines and commonly act as buffering agents to maintain chemical stability, control tonicity and/or to ensure physiological compatibility. In addition, they may be used to improve flavor . Because of these so called “inactive ingredients”, many pediatric liquid medicines are characterized by having a high concentration of sugars, high titratable acidity and low pH. Because of these characteristics, various studies have pointed out the possible relationship between dental caries and frequent intake of liquid oral medicines [3, 5-11]. The presence of sucrose in medicines leads to pH drop of dental plaque, and also acts as substrate for fermentation of oral microbiota,  contributing to dental caries. Dasanayake et al. showed a higher count of Streptococcus mutans (the main microorganism involved with dental caries) in children who took antibiotics during the period considered the most critical to acquire these bacteria, which is between 1 ½ to 3 years of age, when compared to children who did not take antibiotics in the same period. Moreover, these authors observed a correlation between an increase of S. mutans colonies and caries in these individuals. Considering that some medicines may be a threat to oral health causing dental caries and erosion, the aim of this in vitro study was to investigate some physico-chemical properties of liquid oral antibiotics, such as pH, titratable acidity, sugar concentration and viscosity, which may contribute significantly to their cariogenic and erosive potential. Twenty nine liquid antibiotics (Table 1) available in the Brazilian market were selected for this study from a reference list registered in the National Health Surveillance Agency. All of them were oral suspensions and 23 of them had their powders reconstituted with filtered water as recommended by the manufacturers. The labels of each medicine were examined in order to gather information on sugar and acid contents. Analysis of sugars (sucrose, fructose and glucose) and sorbitol were performed using normal-phase HPLC-IR (High-Performance Liquid Cromatography coupled to a Refration Index) [11, 22]. One gram of each bottle was diluted to 50 mL in a volumetric flask with MilliQ water (Milipore, USA). The mixture was vigorously shaken and one aliquot of the supernatant (500 µL each) was diluted with pure acetronitrile in the proportion 1:1 (v/v). The mixture was then centrifuged for 2 minutes (Beckman Microfuge ETM, USA) and the supernatant was directly used for chromatography. The concentrations were calculated using the peak heights of commercial compounds standards of sucrose, fructose, glucose (Sigma Aldrich, USA) and sorbitol (Vetec Química, Brazil). Results were average of replicates from each bottle (sugars and sorbitol concentrations - g/100g - %). Table 1. Brand names, manufacturers and active principles of all antibiotics analyzed in the study. Antibiotics’ pH was determined at room temperature with an electrode connected to a digital pHmeter (Digimed DM 20, USA). The electrode was calibrated at the start of each session using standard buffers of pH 4.01 and 6.86 (Quimis, Diadema, SP, Brazil). Titratable acidity was measured in triplicate for each antibiotic by using the same pHmeter and increments of 0.1N sodium hydroxide (NaOH) were titrated until neutrality (pH 7.0) was reached  A correction factor of 0.87 was obtained by factorizing 0.1 N NaOH solution with potassium biphthalate. The total volume of 0.1 N NaOH solution required to neutralize medicines multiplicated to correction factor of 0.87 corresponded to the titratable acidity value. Viscosity measurements were carried out on a AR 2000 rheometer (TA instrument, USA) using a parallel plate geometry of 25 mm diameter, at a shear rate of 0.1 to 100 s-1 and temperature of 40oC. Viscosity values were obtained at 20s-1. Table 2. 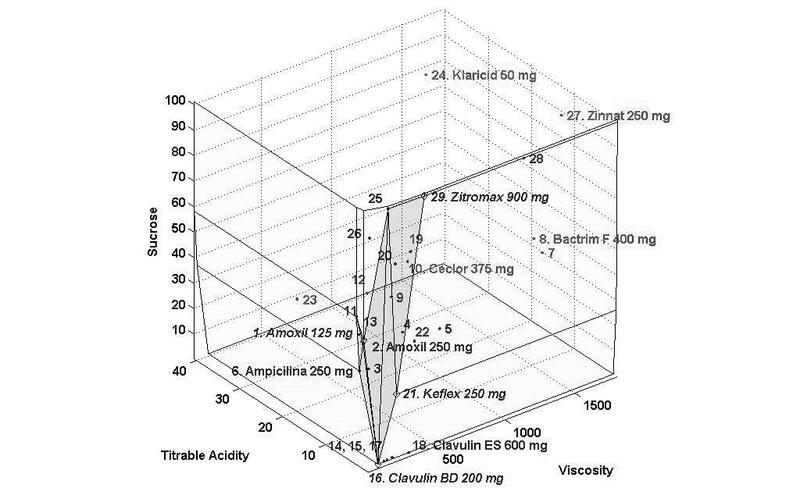 Concentration of sucrose, pH, titratable acidity and viscosity of all analyzed antibiotics. In order to verify how was the performance of each antibiotic in comparison with the others, the DEA (Data Envelopment Analysis) methodology has been used. DEA is a mathematical programming methodology which evaluates the relative performance of list of units with multiple attributes. It identifies a subset of performance “best-practice” elements (benchmarks) and for remaining ones, the magnitude of their lack of performance is measured by comparing to a piecewise frontier constructed from the best elements, facilitating the interpretation of the results. It allowed the evaluation of the relative performance of each antibiotic taking into account the undesirable characteristics (high concentration of sugars, low pH, high titratable acidity and high viscosity) and the desirable ones (absences of sugars, high pH, low titratable acidity and low viscosity) in the sense of tooth dissolution potential. In this analysis, the medicines with performance of 100% are those which present better characteristics in comparison with the others and, therefore, were less likely to harm the tooth enamel. On the other hand, medicines with lower percentile values are those with the worst performance and, in this way, have greater potential for dissolution of dental enamel. Table 3. Performance results (0-100%) of all analyzed antibiotics. The BCC model with input orientation and weight constraints was applied. This analysis was carried out with the software IDEAL (Interactive Data Envelopment Analysis Laboratory), developed by COPPE/UFRJ, which allows the three-dimensional visualization of the performance frontier . Pearson’s correlation coefficients were used to determine whether there was any association among concentrations of sucrose, pH, titratable acidity or viscosity, using the SPSS 20.0® software at a significance level of 5%. The concentrations of sucrose, fructose, glucose and sorbitol as well as pH, titratable acidity and viscosity of all antibiotics are presented as mean values in Tables 2 and 3 and Figs. (1-3) show the performance of the 29 antibiotics analyzed. Fig. (1). Performance frontier for sucrose and titratable acidty. Medicines 14 (Clavulin 125mg), 15 (Clavulin 250mg), 16 (Clavulin BD 200mg), 17 (Clavulin BD 400mg) and 18 (Clavulin ES 600mg) are close to the frontier because their low levels of sucrose and titratable acidity, while medicines 23 (Klaricid® 25mg/5mL), 24 (Klaricid® 50mg/5mL) and 27 (Zinnat® 250mg/5mL) presented the worst performance because of their high levels of sucrose and titratable acidity. Out of the 29 formulations, sucrose was present in 24 of them (83%), with concentrations ranging from 26g% to about 100g%. However, according to the medicine’s labels, only fifteen antibiotics (52%) presented sugars and only four of them specified sugar concentration. None of the antibiotics contained glucose and fructose. Only five antibiotics (17%) were sugar-free. Sorbitol was present in only one medicine (3%), with concentration of 66.9g% and associated with sucrose (Table. 2). Two antibiotics (11%) presented basic pH values of 9.7 and 10.8, while the others presented pH values ranging from 4.1 to 6.9. Fifteen of the 29 analyzed antibiotics (52%) presented pH below the critical value for dissolution of hydroxyapatite (pH 5.5). Values of titratable acidity and viscosity ranged from 0.26 to 40.48 mL and from 20 to 1780 cP, respectively. Pearson’s correlation coefficient’s showed that there was no correlation between pH and titratable acidity (p>0.05) neither between sugar content and viscosity (p>0.05). Fig. (2). Performance frontier for viscosity and titratable acidty. Medicines 7 (Bactrim® 200mg/5mL), 8 (Bactrim F® 400mg/5mL) and 27 (Zinnat® 250mg/5mL) presented low levels of titratable acidity, despite of their high titratable acidity. 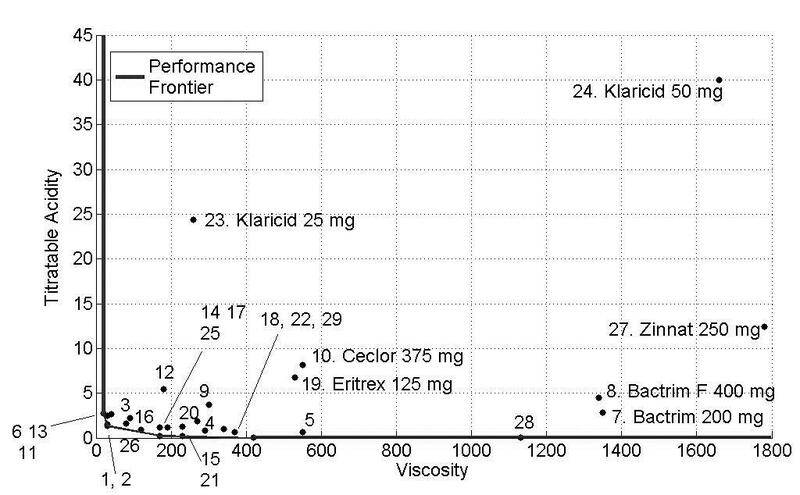 Klaricid® 50mg/mL were distant from performance frontier again, because of their high levels of titratable acidity and sacarose concentration, presenting the worst performance. The DEA methodology allowed the simultaneous evaluation of the analyzed variables (concentration of sugars, pH, titratable acidity and viscosity) and from the scores obtained, antibiotics were classified according to their relative performance. In order to facilitate the interpretation of the results, three figures of the performance frontier were plotted (Figs. 1-3). Each medicine was placed on its corresponding point, according to its attributes, and can be identified by its corresponding number. Medicines placed in the vertex points of each face are considered as references or benchmarks, have 100% performance and constitute the performance frontier. Fig. (1), shows the performance frontier for sucrose and titratable acidty. It can be observed that medicines 14 (Clavulin® 125mg), 15 (Clavulin® 250mg), 16 (Clavulin® BD 200mg), 17 (Clavulin® BD 400mg) and 18 (Clavulin ES® 600mg) presented low levels of sucrose and titratable acidity and, for this reason, are close to the frontier. The medicines 25 (Pen-ve-oral®), 28 (Zitromax® 600mg) and 29 (Zitromax®900mg), despite of being close to the performance frontier due to low titratable acidity, have high concentration of sucrose, which is an undesirable characteristic. On the other hand, the medicines 23 (Klaricid® 25mg/5mL), 24 (Klaricid® 50mg/5mL) and 27 (Zinnat® 250mg/5mL) presented the worst performance because of their high levels of sucrose and titratable acidity. Fig. (2) identifies the medicines with high levels of viscosity and titratable acidity. Despite of their high viscosity, the medicines 7 (Bactrim® 200mg/mL), 8 (Bactrim F® 400mg/5mL) and 27 (Zinnat® 250mg/5mL) showed low levels of titratable acidity. Medicines with low viscosity and titratable acidity and close to the performance frontier presented a better performance. 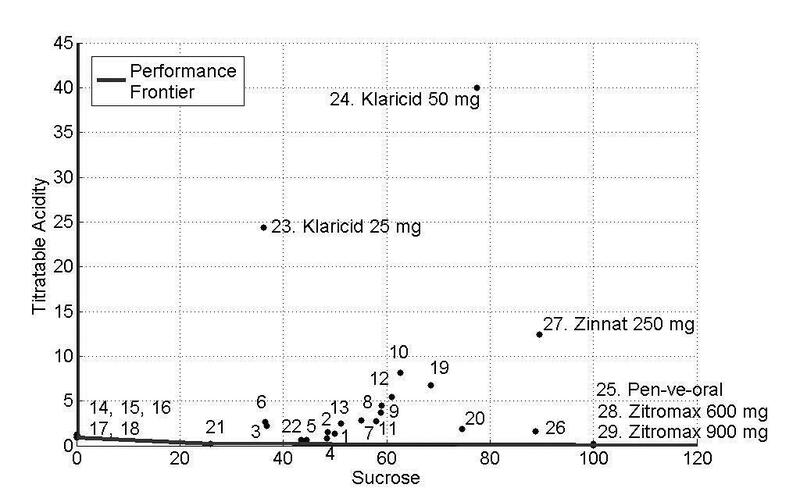 Again, Klaricid® 50mg/mL was distant from performance frontier because of their high levels of titratable acidity and sacarose concentration, presenting the worst performance (8%). Fig. (3). 3D visualization of the performance frontier according to titratable acidity, viscosity and sucrose concentration. Grey area corresponds to the frontier where medicines with 100% performance are included. Klaricid® 50 mg/5mL and Zinnat® 250 mg/5mL were distant from the performance frontier, which means that these medicines have the worst performance and, therefore, greater potential for dissolution of dental enamel. Finally, Fig. (3) shows the 3D visualization of the performance frontier and identifies the best and worst medicines see also Table 3. Regions with higher density of medicines show a group of medicines with an average performance. Klaricid® 50 mg/5mL and Zinnat® 250 mg/5mL were distant from the performance frontier, which means that these medicines showed the worst performance and, therefore, greater potential for dissolution of dental enamel. Antibiotics, which were chosen for this study, as well as cough medicines are the most common sugar-containing medicines regularly used by young children . Considering that they may still be used over relatively long periods, it can be a concern for oral health. Moreover, these medicines can present erosive potential due to presence of acids in their formulations, low pH, high titratable acidity, presence of buffering agents and absence or low concentrations of ions including those of calcium, fluoride, and phosphate in their composition [9, 13, 25, 26]. Although the antibiotics analyzed in this study did not contain glucose and fructose, the presence of high sucrose concentration in 83% of the formulations, ranging from 26g% to about 100g%, poses a real problem to the young consumers. It may increase the caries risk, since sucrose is considered the most cariogenic dietary carbohydrate, because it is fermentable, and also serves as a substrate for the synthesis of extracellular and intracellular polysaccharides in dental plaque [27, 28]. Others studies have reported a predominant use of sucrose as a sweetener in medicines [11, 29-31]. It should be emphasized that in this study three antibiotics presented concentrations of sucrose with values close to 100g%. This peculiarity may be explained mainly by the fact that as sugar is denser than water, then, 100g of the sugar will occupy less space than water. Additionaly, the concentrations of the bioactive compound of these oral suspensions are expressed in µg%, which is under the detection limit of the equipment. This high sugar concentration is unacceptable considering its cariogenic potential. On the other hand, there are controversial studies that show that despite of the potentially high sucrose concentration in antibiotics, they work by reducing the number of Streptococcus mutans and therefore are anticariogenic and may counteract sucrose´s effect [32, 33]. All sweetening agents identified in this study were in accordance with the medicines’ labels. However, sugar concentrations were unspecified. In relation to sugar-based medicines, most labels (93%) alerted that the product should not be consumed by diabetic patients; however, none of them mentioned its cariogenic potential, especially when used for long periods of time. Other factors analyzed in the present study were pH and titratable acidity, and it is still generally accepted that titratable acidity is a better indicator of erosive potential than pH alone [34, 35]. Titratable acidity is the property of an acid solution of keeping its pH when neutralizing agents are added, that is, the measure of its buffering capacity. In this way, a substance with low titratable acidity is readily neutralized by oral fluids, the opposite occurs with that characterized by high acidity, which causes prolonged drop in pH and higher demineralization of the tooth structure. [34, 36] According Jensdottir et al. teeth exposed to a limited volume of a drink with low pH and high titratable acidity for a long time will result in erosive potential and both qualities combined will result in the highest erosive potential. The liquid oral antibiotics analyzed in this study had titratable acidic values ranging from 0.26 to 40.48 mL, but some of them proved to be discrepant in relation to others, which can cause concern. It is now widely accepted that the total titratable acidity is a more accurate measure of the total acid content of a drink, and may, therefore, be a more realistic means of predicting erosive potential. Although the mean endogenous pH for Klaricid® 50mg/5mL and Klaricid® 25mg/5mL was 5.04 and 5.13, their mean titratable acidity was high at 40.48 and 24.64 mL, respectively. It reflects the incorporation of acid in excess in their formulation, which according medicine’s labels is citric acid. Citric acid is considered the main acid used in prolonged oral clearance medicines and as such, is a weak acid, dissociated in solutions with a higher pH and able to act as a buffer over a range of pHs. However, it is a potent erosive agent because of its ability to chelate calcium in hydroxyapatite, thus increasing enamel’s rate of dissolution on exposure to the acid . In the present study, six of the twelve medicines which specified presence of acids presented citric acid in their composition. Other acids presents were clavulanic acid, succinic acid and estearic acid. Again, just as the sweeteners, the real amount present in these products were not stated on the labels. On the other hand, it is important to mention that the consumption of an acidic drink will stimulate salivary flow . It is possible, therefore, that a more acidic drink may be either cleared from the mouth or neutralized more rapidly, due to the increased salivary washing action and buffering capacity, and so will spend less time in contact with the teeth. Clearance of a drink from the mouth will also depend on the ability of a drink to adhere to the enamel . It is necessary to highlight the real impact of the use of oral liquid antibiotics in daily life of children. The amoxicillin, with or without association of clavulanate, is a medicine widely used by children in the treatment of infections. According to our study, despite of presenting a better performance than a lot of medicines (Table 3), the group of amoxicillin (medicines 1 - 5) presented pH values between 5.71 to 6.85 and high concentration of sugar (36.77 to 49.97) which were worrying in relation to oral health. This fact was also noted in medicines 14-18 that showed lower pH values ranging from 4.10 to 4.94 despite of being sugar free, which can favor to dental erosion. Other medicines widely used in routine of immunocompromised patients to prevent opportunistic infections are Bactrim® and Bactrim F® (medicines 7 and 8). These medicines appeared distant from the performance frontier because of their high concentrations of sucrose and high viscosity (Fig. 3), despite of their low titratable acidity (Fig. 2). It is also important to note the main factors that seem to increase the likelihood of an individual suffering from dental erosion includes salivary flow rate, pH, buffering capacity and pellicle formation [41-43]. All these factors added to the properties of the drink itself, as well as associated factors relating to the method of drinking, frequency of consumption, salivary parameters and dental plaque play a role in the development of dental erosion. In addition, in medically compromised children, many of these medicines may be taken at times remote from food intakes or at night when salivary flow is reduced, and these factors may add to the potential erosive challenge . This fact is of concern because of the known relationship between carbohydrates and dental caries, and it becomes even more alarming if one considers that not all the pediatricians gave parents instructions about oral hygiene after medicine’s intake. In a previous study,  pediatricians did not perceive the correct relationship between the presence of acidity in medicines and dental erosion; however, most of them presented a reasonable awareness about the relationship between sugared pediatric medicines and dental caries. Nevertheless, not all of them recommended oral hygiene after their consumption (50.80%). Another study, verified that only 21.2% of the guardians that associated the use of pediatric liquid medicines with the development of dental caries performed the oral hygiene of their children. In addition, 84.9% of those guardians had never received instructions of oral hygiene after the intake of medicines . In relation to oral hygiene immediately after acidic products, literature has reported that eroded enamel is more susceptible to wear by tooth-brushing and to toothpaste abrasion [46, 47]. In this way, after consuming acidic foods or drinks, tooth-brushing should be delayed to allow the saliva to exert its natural remineralizing action on the eroded enamel, thereby resulting in increased resistance to abrasion . Recommendation on immediate water rinse and delayed tooth-brushing after syrup medicines’ ingestion could be proposed at the time of prescription. Medicine’s labels also should alert in relation to the possibility of cause dental caries and erosion because many products could be consumed for prolonged periods, several times a day, at bedtime, and without adequate oral hygiene, will certainly contribute to dental caries and erosion. Most of the analyzed antibiotics presented high sugar concentration, titratable acidity and viscosity, and low pH which can be considered as risk factors for dental caries and erosion when consumed frequently. We advise, therefore, the use a warning about the medicine’s cariogenic potential in their labels. It is also necessary to recommend oral hygiene after the medicine’s intake. Clinical studies are necessary to determine the real extension of the problem. The authors are grateful to Prof. Elizabete Lucas and Léa Lopes for their support in the viscosity analysis at IMA (Instituto de Macromoléculas Eloisa Mano), Federal University of Rio de Janeiro (UFRJ) and to Viviane Pierro for her critical review of this manuscript. The authors also would like to thank CNPq for the research grant (308029/2006-2) and FAPERJ (E-26/171.241/2006) for the financial support. “Inactive” ingredients in pharmaceutical products: update (subject review). Pediatrics 1997; 99(2): 268-78. Kenny DJ, Somaya P. Sugar load of oral liquid medications on chronically ill children. J Can Dent Assoc 1989; 55(1): 43-6. Bigeard L. The role of medication and sugars in pediatric dental patients. Dent Clin North Am 2000; 44(3): 443-56. Maguire A, Baqir W, Nunn JH. Are sugars-free medicines more erosive than sugars-containing medicines? An in vitro study of paediatric medicines with prolonged oral clearance used regularly and long-term by children. Int J Paediatr Dent 2007; 17(4): 231-8. Mackie IC, Bentley E. Sugar-containing or sugar-free paediatric medicines: does it really matter? Dent Update 1994; 21(5): 192-4. Mackie IC, Worthington HV, Hobson P. An investigation into sugar-containing and sugar-free over-the-counter medicines stocked and recommended by pharmacists in the north western region of England. Br Dent J 1993; 175(3): 93-8. Maguire A, Rugg-Gunn AJ. Prevalence of long-term use of liquid oral medicines by children in the northern region, England. Community Dent Health 1994; 11(2): 91-6. Maguire A, Rugg-Gunn AJ, Butler TJ. Dental health of children taking antimicrobial and non-antimicrobial liquid oral medication long-term. Caries Res 1996; 30(1): 16-21. Durward C, Thou T. Dental caries and sugar-containing liquid medicines for children in New Zealand. N Z Dent J 1997; 93(414): 124-9. Shaw L, Glenwright HD. The role of medications in dental caries formation: need for sugar-free medication for children. Paediatrician 1989; 16(3-4): 153-5. Neves BG, Farah A, Lucas E, de Sousa VP, Maia LC. Are paediatric medicines risk factors for dental caries and dental erosion? Community Dent Health 2010; 27(1): 46-51. Rekola M. In vivo acid production from medicines in syrup form. Caries Res 1989; 23(6): 412-6. Dasanayake AP, Roseman JM, Caufield PW, Butts JT. Distribution and determinants of mutans streptococci among African-American children and association with selected variables. Pediatr Dent 1995; 17(3): 192-8. Moss SJ. Dental erosion. Int Dent J 1998; 48(6): 529-39. Nunn JH, Ng SK, Sharkey I, Coulthard M. The dental implications of chronic use of acidic medicines in medically compromised children. Pharm World Sci 2001; 23(3): 118-9.
 da Costa CC, Almeida IC, da Costa Filho LC, Oshima HM. Morphology evaluation of primary enamel exposed to antihistamine and fluoride dentifrice-an in vitro study. Gen Dent 2006; 54(1): 21-7. McNally LM, Barbour ME, O’Sullivan DJ, Jagger DC. An in vitro investigation of the effect of some analgesics on human enamel. J Oral Rehabil 2006; 33(7): 529-32. Babu KL, Rai K, Hedge AM. Pediatric liquid medicaments-do they erode the teeth surface? An in vitro study: part I. J Clin Pediatr Dent 2008; 32(3): 189-94. Hellwig E, Lussi A. Oral hygiene products and acidic medicines. Monogr Oral Sci 2006; 20: 112-8. Valinoti AC, Neves BG, da Silva EM, Maia LC. Surface degradation of composite resins by acidic medicines and pH-cycling. J Appl Oral Sci 2008; 16(4): 257-65. Feigal RJ, Jensen ME, Mensing CA. Dental caries potential of liquid medications. Pediatrics 1981; 68(3): 416-9. Trugo LC, Farah A, Cabral L. Oligosaccharide distribution in Brazilian soya bean cultivates. Food Chem 1995; 52: 385-7. Lins ME, Lobo MS, da Silva AC, Fiszman R, Ribeiro VJ. The use of Data Envelopment Analysis (DEA) for Brazilian teaching hospitals’ evaluation. Cien Saude Colet 2007; 12(4): 985-98. Mackie IC, Worthington HV, Hobson P. Paediatric sugar-free medicines-stock and recommendations. Pharm J 1992; 248: 621-2. Lussi A, Jaeggi T, Zero D. The role of diet in the aetiology of dental erosion. Caries Res 2004; 38(Suppl. 1): 34-44. Featherstone JD, Rodgers BE. Effect of acetic, lactic and other organic acids on the formation of artificial carious lesions. Caries Res 1981; 15(5): 377-85. Bowen WH. Do we need to be concerned about dental caries in the coming millennium? Crit Rev Oral Biol Med 2002; 13(2): 126-31. Newbrun E. Sucrose, the arch criminal of dental caries. Odontol Revy 1967; 18(4): 373-86. Lima KT, Almeida IC, Sena EL. Sweeteners and endogenous pH of pediatric medicines. J Dent Res 2000; 79: 1130. Pierro VS, Abdelnur JP, Maia LC, Trugo LC. Free sugar concentration and pH of paediatric medicines in Brazil. Community Dent Health 2005; 22(3): 180-3. Neiva A, Silva VS, Maia LC, Soares EL, Trugo LC. Análise in vitro da concentração de sacarose e pH de antibacterianos de uso pediátrico. Pesqui Bras Odontopediatria Clin Integr 2001; 1: 9-16. Karjalainen S, Rekola M, Ståhlberg MR. Long-term effects of syrup medications for recurrent otitis media on the dental health of 6 to 8-year-old children. Caries Res 1992; 26(4): 310-4. Paunio P, Rautava P, Helenius H, Alanen P, Sillanpä M. The finnish family competence study: The relationship between caries, dental health habits and general health in 3-year-old Finnish children. Caries Res 1993; 27(2): 154-60. Edwards M, Creanor SL, Foye RH, Gilmour WH. Buffering capacities of soft drinks: the potential influence on dental erosion. J Oral Rehabil 1999; 26(12): 923-7. Grobler SR, Jenkins GN, Kotze D. The effects of the composition and method of drinking of soft drinks on plaque pH. Br Dent J 1985; 158(8): 293-6. Rytömaa I, Meurman JH, Koskinen J, Laakso T, Gharazi L, Turunen R. In vitro erosion of bovine enamel caused by acidic drinks and other foodstuffs. Scand J Dent Res 1988; 96(4): 324-33. Jensdottir T, Bardow A, Holbrook P. Properties and modification of soft drinks in relation to their erosive potential in vitro. J Dent 2005; 33(7): 569-75. Grenby TH, Phillips A, Desai T, Mistry M. Laboratory studies of the dental properties of soft drinks. Br J Nutr 1989; 62(2): 451-64. Sorvari R, Rytömaa I. Drinks and dental health. Proc Finn Dent Soc 1991; 87(4): 621-31. Ireland AJ, McGuinness N, Sherriff M. An investigation into the ability of soft drinks to adhere to enamel. Caries Res 1995; 29(6): 470-6. Meurman JH, ten Cate JM. Pathogenesis and modifying factors of dental erosion. Eur J Oral Sci 1996; 104(2 ( Pt 2)): 199-206. Milosevic A. Sports drinks hazard to teeth. Br J Sports Med 1997; 31(1): 28-30. Bevenius J, L’Estrange P. Chairside evaluation of salivary parameters in patients with tooth surface loss: a pilot study. Aust Dent J 1990; 35(3): 219-21. Neves BG, Pierro VS, Maia LC. Pediatricians’ perceptions of the use of sweetened medications related to oral health. J Clin Pediatr Dent 2008; 32(2): 133-7. Neves BG, Pierro VS, Maia LC. Perceptions and attitudes among parents and guardians on the use of pediatric medicines and their cariogenic and erosive potential. Cien Saude Colet 2007; 12(5): 1295-300. Hooper S, West NX, Pickles MJ, Joiner A, Newcombe RG, Addy M. Investigation of erosion and abrasion on enamel and dentine: a model in situ using toothpastes of different abrasivity. J Clin Periodontol 2003; 30(9): 802-8. Rios D, Honório HM, Magalhães AC, et al. Effect of salivary stimulation on erosion of human and bovine enamel subjected or not to subsequent abrasion: an in situ/ex vivo study. Caries Res 2006; 40(3): 218-3.